Full Name: Clement Franklin "Clem" Fain, Jr. Biography of Clem F. Fain, Jr., Volume 2, pp. 301-302. Texas Democracy: a Centennial History of Politics and Personalities of the Democratic Party, 1836-1936, 1937. United States Marine Corps, Lieutenant, World War II. "Legislature Faces Problem of Absences: Men in Armed Forces Can't Get Leave to Attend Sessions," 1/1/1943. Dallas Morning News. United States Marine Corps, First Lieutenant. "Fain Will Be Fifth Senator in Service," 2/13/1943, p. 8. Lubbock Morning Avalanche. 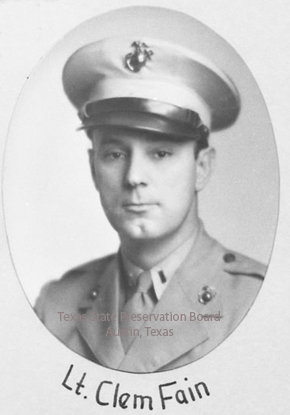 Pictured in uniform in 48th Senate composite photo and listed as Lt. Clem Fain. State Preservation Board. Fain, Clement Franklin. Texas State Cemetery.